Select the User Permissions tab. You will see a list of permissions divided by category. You can search for a user and compare their permissions with two other role types. Change the permission for this user by clicking on the blue star. A green checkmark means that the user has permission to see or perform the item. A red cross means that the user does not have permission to see or perform the item. If the change is unsaved, then you will see a black dot next to it. Pressing the save icon in the upper right corner will save your changes and you will see the dot disappear. 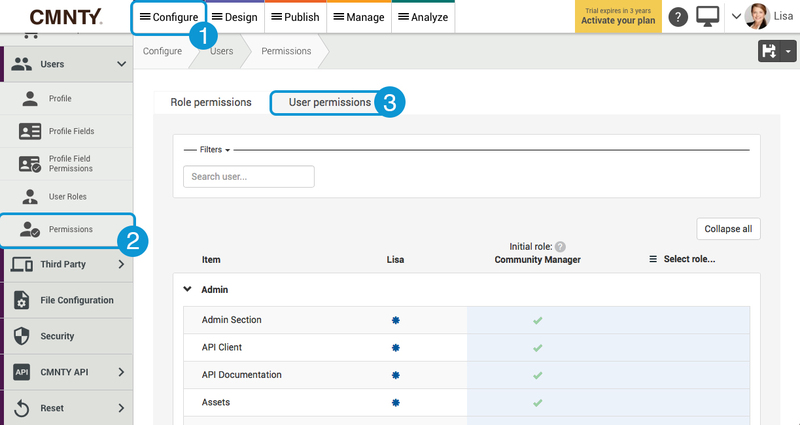 Looking for how to assign user role permissions?